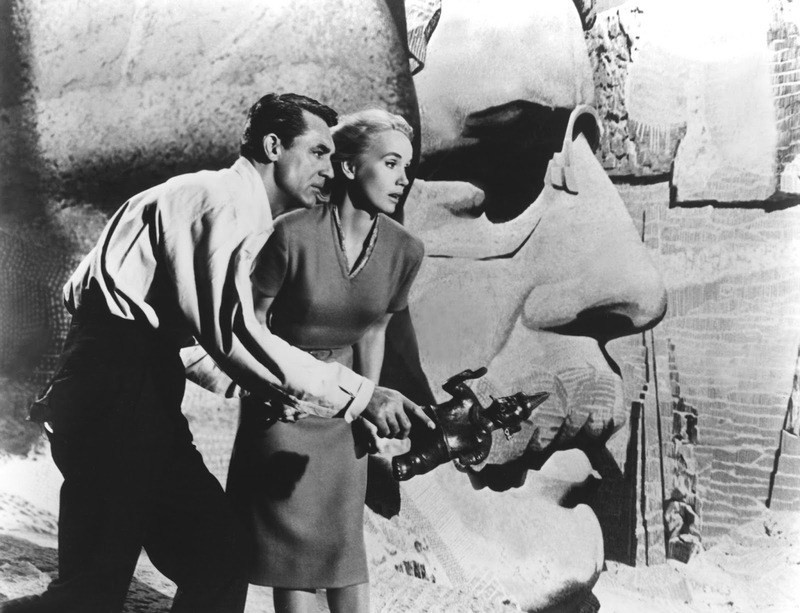 North by Northwest (1959), starring Cary Grant and Eva Marie Saint, is one of the 1001 classic movies you should see. Each Monday, I'm going to recommend a classic movie you should see (for the reasons behind the 1001 series and reviews of earlier films covered go here). In honor of the Presidential election on Nov. 8, this month's selections will focus on film portrayals of U.S. commanders in chief. This week's selection is director Alfred Hitchcock's thriller, North by Northwest (1959), which has its breathtaking climax on Mount Rushmore. North by Northwest follows New York City ad man Roger Thornhill (Cary Grant), whose cushy lifestyle of cocktail business meetings and Broadway opening nights is rudely interrupted when he is kidnapped and taken to a remote country home. There he is questioned by a mysterious man named Phillip Vandamm (James Mason), who believes that Thornhill is actually a government agent named George Kaplan. Thornhill eventually escapes, but Vandamm's men pursue him to the United Nations headquarters, Chicago, and eventually Mount Rushmore. In 1958, Hitchcock was under contract to adapt the novel, The Wreck of the Mary Deare, for MGM (Mary Deare was eventually made with director Michael Anderson and stars Gary Cooper and Charlton Heston), but, after trying and failing to come up with an acceptable script, the director and screenwriter abandoned the book in favor of an original screenplay that would, in Lehman's words, be "the Hitchcock movie to end all Hitchcock movies." Lehman and Hitchcock began trading ideas about set pieces, including the director's long cherished idea of having Grant hide inside the nose of Rushmore's Abraham Lincoln sculpture. The result was a movie that broke box office records in 1959 and is still one of the most recognizable of old Hollywood films. Hitchcock's Mount Rushmore idea didn't set well with the National Park Service, who only allowed limited filming on the National Monument. A few of the exterior shots are from the real Mount Rushmore, but the chase scenes that make up the climax of the movie were filmed in the studio using sets, matte paintings, and trick photography. Still, park service officials were not happy when the film was released. 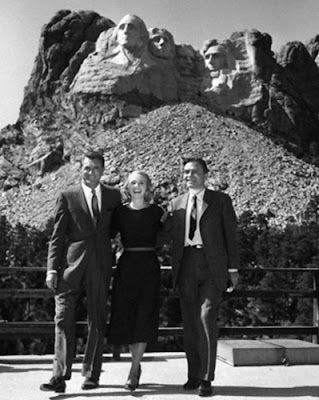 They had extracted a meaningless promise from the filmmakers that there would be no violence during the Rushmore scenes -- in fairness, Hitchcock did remove a scene where Grant and Eva Marie Saint slide down Lincoln's nose because of park service objections -- and they subsequently demanded that the item thanking the Park Service for its cooperation be removed from the credits. 1. Grant's character. Hitchcock had a lifelong fear of being falsely accused of a crime, and North by Northwest is his most fully realized movie on the "wrong man" theme. Thornhill is accused of murder, shot at, and nearly driven off of a cliff before the truth is revealed. 2. Saint's character. MGM wanted Cyd Charisse for the role of spy Eve Kendall, but Hitchcock wanted and got Saint, who was a widely respected Academy Award winning character actress. Hitchcock shaped Saint into his image of a blonde beauty, even picking out her wardrobe at Bergdorf Goodman. 3. Crop duster scene. One of the most famous moments in movie history, this brilliantly designed and photographed scene shows Hitchcock as the complete master of the cinematic medium. Everything from the remote location near Delano, Calif., to Grant's air of harried annoyance works together to create one of the supreme moments in American movies. 4 Sets. 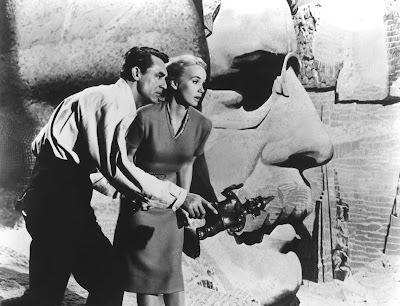 There was location shooting in North by Northwest, but most of what viewer's see is carefully designed studio sets that recreate the United Nations, the visitor's center at Mount Rushmore, and a house designed by famed architect Frank Lloyd Wright. Cary Grant, Eva Marie Saint, and James Mason at Mount Rushmore. Other critics: North by Northwest has an 100 percent fresh rating at Rotten Tomatoes and Leonard Maltin calls the film "one of the all-time great entertainments" with"one memorable scene after another including now legendary crop-dusting and Mount Rushmore sequences" in a four star review for his Classic Movie Guide. Critics in 1959 mostly praised the movie. A.H. Weiler of The New York Times named it one of the top movies of the year calling it "the year's most scenic, intriguing, and merriest chase," but he saved most of his plaudits for the movie's star. "Cary Grant, a veteran member of the Hitchcock acting varsity, was never more at home than in this role of the advertising-man-on-the-lam. He handles the grimaces, the surprised look, the quick smile, ... and all the derring-do with professional aplomb and grace." The bottom line: If all you've ever seen of North by Northwest is the famous crop-dusting sequence, do yourself a favor and watch the whole movie. You'll be rewarded with a fresh, modern thriller that is also one of old Hollywood's great films. 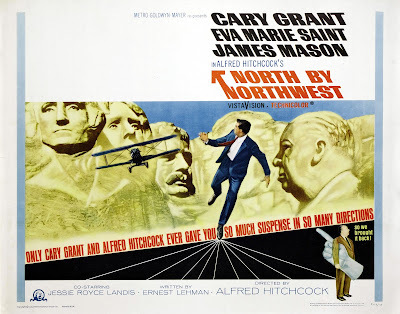 Availability: North by Northwest will air at 5:30 p.m. Dec. 28 and 6:30 a.m. Feb. 19 at TCM. It is also available on DVD, Blu-ray, and video on demand. Next week, I'll continue the theme of movies about American Presidents with Broadway showman George M. Cohan (James Cagney) telling his life story to President Franklin D. Roosevelt in Yankee Doodle Dandy (1942).